Kit and Port Moresby are American travellers who are trying save their ailing marriage by finding (or loosing) themselves in North Africa for a year. However, tagging along for the ride is their mutual friend George Tunner, turning company into something of a crowd. Upon arrival in Tangiers, the trio head for a bar where they are observed through the unblinking gaze of the original creator of their characters, the 80 year-old writer Paul Bowles whose acclaimed 1949 novel provides the basis for the film. It’s an interesting contrivance by director Bernardo Bertolucci that highlights the existential nature of the story. John Malkovich makes a wonderful Port, wafting through the shadowy kasbahs and falling under the spell of exotic women offered up to him in seedy tents. Debra Winger grows on you as Kit, an unusual character modelled on Bowles’s own wife Jane who was also a writer of note. And Campbell Scott is downright dapper as Tunner, wooing Kit with his stash of French champagne and spraying his insect infested environments with DDT. As the travellers head deeper and deeper into the mesmeric desert their numbers dwindle until just Kit remains, confronting herself in stark solitary madness. Ryuichi Sakamoto provides a dream-like score that won him a Golden Globe Award. And director of photography Vittorio Storaro earned a BAFTA for his stunning work capturing those magical moments when sunlight turns Moroccan mountains gold and crescent moons loom large over Saharan sand dunes. 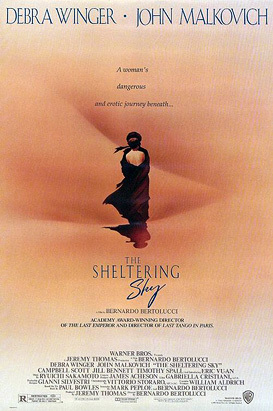 The Sheltering Sky is like a waking dream, both for the characters and the audience. Some viewers may well prefer to fall asleep but for those who do go the distance there’s a spectacular ride on a camel caravan with the Tuaregs, those blue indigo men of the desert whose remote oases only the very privileged get to see.